If you think of a tripod only as a three-legged camera support system, perhaps a refresher course is in order. 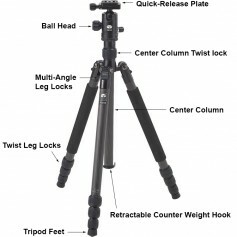 In recent years, tripods have evolved and the types have expanded. Yes, all tripods still support cameras, but there is so much more to know about them today. The marketplace is flooded with hundreds of tripods of all costs. Why are some models so cheap and others so expensive? How do you know which are for video and which are for still photography? In this article, we’ll try to explore some differences. First of all, some tripods are designed specifically for video, while others are for still photographers. In this era of DSLR video cameras, however, the two distinctions blur, since one camera can be used for both video and stills. The type of work you do determines the tripod and head needed. Of course, the primary purpose of all tripods is to hold a camera with no movement or vibration. However, tripods today come in many variations with different parts. Almost every part comes in a myriad of shapes, sizes and materials. Yet, regardless of the differences, stability of the camera remains the key goal. B&H Photo, in a recent white paper, reviewed the various configurations of tripods and heads available. Their overview explains why there are so many choices facing today’s image-makers. Sachtler 0775 FSB-8 Tripod System. Key with every tripod is the head. Not only does it provide a way to attach a camera to the tripod, but it comes with capabilities that vary with the type of images being made. The head is the most important difference between tripods used for video and still shooting. Traditional three-way or pan-and-tilt heads, for both still photography and video, are used to adjust the position of the head one axis at a time — vertical, horizontal and panning. Moving the head about one of the axes is accomplished by “loosening” one of the arms with a twist, repositioning the head and then re-tightening the arm. The advantage of the three-way head is precise movements about one axis. The disadvantage is size, since they are generally bulky due to the extending arms. Fluid heads, a type of pan-and-tilt head preferred by video shooters, use a sealed liquid to create a miniature hydraulic damping system that enables smooth, steady motion when moved through a given space. True fluid heads are best for video professionals. True fluid heads are considerably more complex in design and require a greater degree of precision to manufacture than standard fluid heads. As a result they’re more expensive, but they provide a range of damping and resistance adjustments to suit a variety of shooting requirements. True fluid heads also deliver smoother, more predictable and controllable panning and tilting actions than lower-cost fluid-effect heads. Other video heads are specialized combination pan/tilt fluid heads that incorporate additional features, such as geared rotation adjustments, heavy-duty load capacity, bubble levels and greater adjustment lock options. Some models have adjustable counterbalance springs so they can be fine tuned to the exact balance point with a wide range of cameras of various weights. There are video heads that allow full adjustment of the fluid drag so that motion can be more precisely controlled, regardless of what kind of video equipment is being used. Also used for video, but mostly for still photography, are ball heads. They consist of a ball enclosed in a housing with a tightening knob. When the knob is loosened, the ball can be repositioned. When the camera is in the desired position, the knob is tightened and the ball and camera remain still. Some ball heads have secondary and tertiary controls. Some have panning bases with a separate knob to lock the head in the panning axis. Others have adjustable friction knobs and controls that allow adjustment of the main knob’s friction for more precise control. 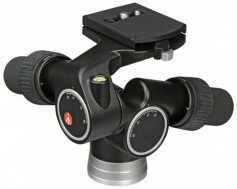 Manfrotto 405 Pro Digital Geared Head. The geared head is a variant of the three-way head, but, instead of handles that loosen their axis when twisted, a system of gears moves the head about one particular axis when the handles are twisted. This gearing allows for very fine and precise adjustments — the geared head’s biggest advantage. The disadvantages of these heads are weight, complexity and the relatively slow speed of repositioning. 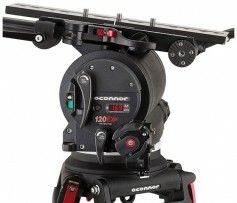 Gimbal heads are used with large and heavy telephoto lenses. Because of the shift in a camera/lens combination’s center of gravity when using extremely large lenses, the gimbal head is attached to the lens’s tripod attachment point, not to the camera. It is designed to allow rapid movements of the lens to track fast-moving subjects. Because of this design, and the systems with which it is designed to work, the gimbal head is mainly used in wildlife and sports photography. The chassis (or spider) is the apex of the tripod, where the legs connect. The chassis forms a platform for mounting a head, or it serves to surround the tripod’s center column. 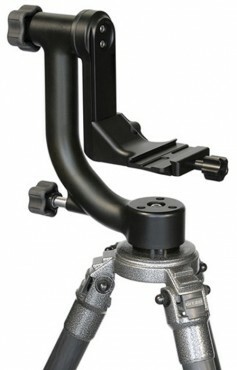 Some chassis that allow direct mounting of the tripod head feature interchangeable center plates that permit the addition of an optional center column or other types of mounting systems. The chassis is usually made from some sort of metal alloy. Maximum stability is gained with a tripod that does not have a telescoping center column chassis. Most tripod legs are “multi-angle.” This means that you can adjust the spread of the legs to allow the tripod to be used at different heights or in awkward areas where one leg or more legs cannot be at the same angle as the others. Some chassis permit the legs to reach a nearly horizontal position, and some, especially for travel tripods, allow the legs to invert for more compact storage. The leg locks are designed to hold the legs at a prescribed angle and come in designs of all types. Some have pull-out tabs that unlock the leg angle, others have sliders, friction knobs or spring-loaded mechanisms. The tripod center column is either mounted to the chassis, or permitted to slide through it to extend the tripod’s height even farther than the leg/chassis alone. Many center columns are reversible to allow the user to mount the camera below the tripod chassis for macro or other low-to-the-ground shots. Most center columns have a friction collar that keeps them in place until they are called to extend. Some have a geared system with which you can crank a lever to raise and lower the column. 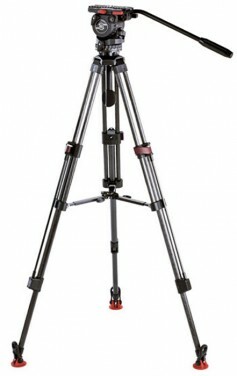 The crank systems are usually seen on heavier studio tripods because they add considerable weight to the tripod system. The general rule is that users should not extend the center column unless it’s necessary to get the shot, since there is a loss in stability and an increase in possible vibrations when the column is extended. This is especially true with multi-section center columns. All tripods have three legs. But, there are variations in how those legs are constructed and how they work. Except for single-section tripod legs, most tripod legs are telescoping and collapsible for the purposes of height adjustment and transport. The more sections the legs have, the shorter they can be retracted. However, the more sections, the less stability achieved. If possible, avoid extending the smallest section of the tripod all the way. Leaving the bottom section partially retracted can add overall stability to the rig. There are three basic materials for the modern tripod leg — aluminum, carbon fiber and wood. All of them have inherent advantages and disadvantages. There are other materials available, from common ABS plastic to steel to exotic basalt lava. At the end of each leg there is a foot. Depending on the tripod, the foot might be as simple as a rubber bumper or it can have a retractable spike beneath a rubber pad. Options include spikes, strakes, clawed feet and various rubber bumpers. Load capacity is crucially important to a tripod. Tripod legs and heads have specified load capacities. The stability of the combination of the legs and head is equal to the lower of the two. For instance, if you have tripod legs with a 40 pound load capacity and a tripod head with a 20 pound load capacity, the effective load capacity of the setup is 20 pounds. The load capacity is not indicative of the breaking strength of the component, nor does it indicate when the setup will collapse. This specification shows at what weight the stability of the system starts to become compromised as far as stability is concerned. The common conservative rule of thumb is to use a tripod and head that have at least two to three times the load capacity of your heaviest camera/lens combination, not forgetting accessories such as batteries, lighting or microphones. Tripods come in different heights. One thing that gets old quickly is setting up a camera on a tripod and spending minutes bent over at the waist looking through the viewfinder. Do the math and add the height of the legs and the height of the head together to find out where the viewfinder should be. Vibration can be a factor in tripod use. Visualize wind blowing across the gear or a subway rumbling beneath the street. The goal of the tripod is to provide stability and absorb those vibrations so that they are not translated to the camera. 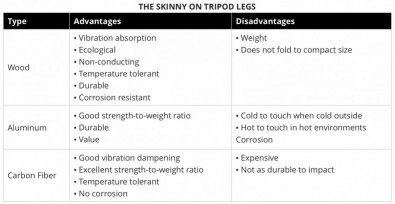 Larger tripods have more stability, but they are heavier. Smaller tripods are more portable and easy to carry, but have less stability. Compromise begins when the realization comes that someone must hand-carry the tripod to a distant location or pack it into carry-on luggage. And finally, on the issue of cost, be reasonable. If you start off buying a bargain tripod, you will likely feel the need to upgrade to a better one in the near future. There are few things as frustrating as working with a sub-par tripod and not getting the needed stability. Soon, many find they have spent more money on the first several tripods than on one high-quality, more expensive one to begin with. Tripods and heads are a long term investment and there are no shortcuts. Buy a good one up front.